Glyphosate, the active ingredient in Monsanto’s Roundup and other weedkillers, is the most widely used pesticide in the United States and has been designated as a probable human carcinogen by the World Health Organization. More than 280 million pounds were used in the United States agricultural sector in 2012. While the majority of glyphosate was applied in the country’s Midwest, a significant portion was used in California. For this analysis the Center for Biological Diversity – in coordination with the Center for Environmental Health, El Quinto Sol de America, Californians for Pesticide Reform, the Center for Food Safety, and the Pesticide Action Network – examined where glyphosate was used in California and compared it to the socioeconomic and racial makeup of those areas. 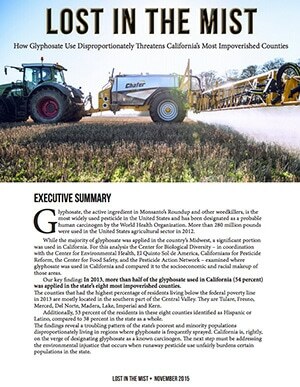 Our key finding: In 2013, more than half of the glyphosate used in California (54 percent) was applied in the state’s eight most impoverished counties. The counties that had the highest percentage of residents living below the federal poverty line in 2013 are mostly located in the southern part of the Central Valley. They are Tulare, Fresno, Merced, Del Norte, Madera, Lake, Imperial and Kern. Additionally, 53 percent of the residents in these eight counties identified as Hispanic or Latino, compared to 38 percent in the state as a whole. The findings reveal a troubling pattern of the state’s poorest and minority populations disproportionately living in regions where glyphosate is frequently sprayed. California is, rightly, on the verge of designating glyphosate as a known carcinogen. The next step must be addressing the environmental injustice that occurs when runaway pesticide use unfairly burdens certain populations in the state.